I don’t get into sales very often, but the good people at MONO are running a “private” sale right now that I can get behind. Until 12/3113, you can purchase SPECIFIC items for a 50% discount and get free ground shipping (US only) while supplies last. The Mono M-80 Single lists for $240 on the site and normally sells for $205 direct. 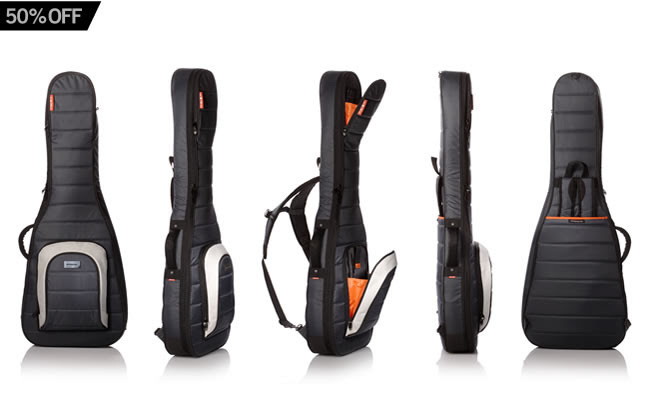 If you add the GREY model to your shopping cart during the sale you’ll get it for $102 – which is a steal for this hybrid gig bag. 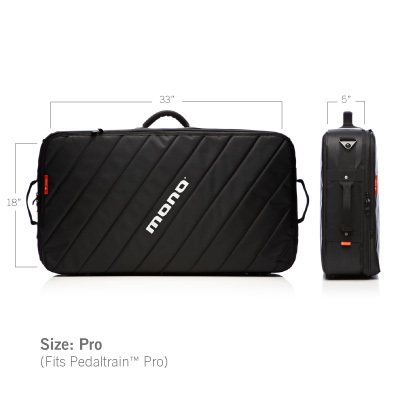 The Mono M-80 Pro Size Pedal Board lists for $240 on the site and normally sells for $199 direct. If you add the GREY model to your shopping cart during the sale you’ll get it for $100. This is a little too big for my Pod HD, but if it was the smaller size I’d be all over it. The Platinum Grey Warsaw Stap is 50% off. It’s cool – but I like 3″ wide straps so it’s not for me. It IS made out of seatbelt material so it should be able to handle any rigors of touring. I used PayPal to check out and was initially annoyed that I has to choose a shipping method, but as long as I chose FEDex ground, they autopopulated a free holiday shipping discount in before I played my order. The shipping center is closed on the 24th. So any orders placed after then would get shipped in the new year. The Mono site can be found here. I can’t recommend their gig bags enough. If you can live with Steel Grey – it’s a great deal! It was back in Boston. I had walked into a small club called TT the bear’s (which I had played on many occasions before) to see my friend’s band play, and one of the opening bands was an early incarnation of The Willard Grant Conspiracy. When I see bands on SNL and there are 10 people on stage individually playing nothing and it cumulatively sounds like 3 competent musicians are playing it drives me nuts. In this case, there were six or eight people on stage (all playing acoustic instruments …some acoustic guitars, a violin, mandolin, bass, and Robert Fisher’s vocals) and it sounded enormous. They devoured the air in the room and for 40 minutes or so – we were collectively sucked into a black hole and left staring in mute wonder at this immense vortex we were in and then we were spit back out into the reality of a small club with sticky floors. There wasn’t a II V I or an altered chord in sight. The time signatures were common. Nothing faster than an 1/8th note was played. It was a number of musicians playing the same rhythms (and playing off of that rhythm) to create a specific immersive sound. Everything was in service to the vocal and the song. It gets easy to get caught up in what this person is doing or what that person is doing online, but it’s the moments that move you that stay with you forever. I can tell you to go check out their Flying Low cd, but the communal moment I had with Willard Grant and a few other people in that small room is what stays with me as I listen to “House Is Not a Home” as I type this. My experience in listening to those songs will always be tied to that moment. Here’s the biggest secret I can tell you about musical performance. The single biggest factor pulling off any performance for a live audience is conviction. If you have it, you can sit on an avoid note and everyone will nod their heads, if you don’t have it you can hit every note with MIDI-like precision and elicit yawns in response. All the shedding you do is really to get the material under your fingers so you can play it with conviction when you perform. Some people tap into that with a minimal amount of musical skill and training. Some people train their whole lives and never find it. When you speak with authority, people listen to what you have to say (you do have the musical vocabulary and skill to help sustain what’s happening yes? – I’d argue that people who perform with real conviction find natural rhythm, dynamics and other elements intuitively in many cases – the so called “musical” considerations fall into line with the force of the message being delivered.) Now that audience might ignore it if it doesn’t continue to move or reach them, but it at least gets their ear. It get’s easy to get caught up in the technique or the application of what we do and loose the forest looking for the tree. Guitarists serve the guitar but musicians serve the song. Sometimes that’s Willard Grant, sometimes that’s seeing a video of Yngwie killing it with Alcatrazz on a live show in Japan. Sometimes that’s the song you’re playing and sometimes it’s the song of your heart, but whichever one you’re playing – play it like you’re opening that vortex and bring people in. I hope this helps in some way and as always, thanks for reading! I’ll have my guitar…and some books…and notes. Beaucoup notes at that! As I’ve posted before, I just recently moved from South Pasadena, CA to Brooklyn, NY. I did a similar move back in 2006 when I moved from Boston to go to CalArts in Valencia, CA and in both cases people were shocked when I said that I mailed everything. Had I already owned a car, I might have looked into getting a trailer and doing the move, but since Boston isn’t a very car friendly town (as one winter of $600 in parking and tow fees attested to), I had gotten rid of my car years ago and renting a car for that distance and time wasn’t financially viable. So we mailed it all and then when we came back to the east coast, we did it again. We spent about $1500 in shipping to get everything here. Given that the estimate for a POD delivery across the coast would have been close to $7,000, the van rental would have been about $4-$5,000, I got off light. (Mind you, if the move was a shorter distance, we probably would have gone with the POD option). If you have to go this route I can give you some suggestions based on my experience – but keep in mind that other options may be available and/or preferable to you. One thing I looked into initially was freight shipping (where all of your stuff is clear wrapped on pallets, billed by weight and typically shipped by truck). While this would have been cheaper that piecemealing the shipments as we did, it was a little too rough for the instruments. They’d get hit with a lot of heat and while any commercially available guitar goes through the same process essentially to get to the store – it wasn’t something I wanted to risk. The logistics of getting something freight shipped to NY and then getting it to our apartment also wasn’t feasible. For instruments – I’ve always used UPS. They’re not the cheapest method of shipping – but the UPS stores I’ve been to do a better job packing than I would have. It’ll cost you about $30 a box to do – but the shipping is determined by whichever is more expensive. So in the case of guitars, the expense comes from the size of the box being shipped, so the weight isn’t a factor. In once case I stuffed a heavy-duty music stand and instrument stand and it all got wrapped and shipped under the $30. I shipped 3 basses together this way in 1 oversized box. filled it with about 2 trash bags worth of peanuts. So, yes you can do it cheaper on your own – but if you don’t have that much bubble wrap or peanuts handy (or a guitar sized box) – do you want to be running around trying to deal with that? You get $100 insurance on everything you ship automatically. You can get more insurance BUT if you pack it on your own, they can dispute the claim because they don’t know what measures were taken to ship it. So for that reason alone – it’s worth the $30 for them to pack it. Slack the strings as much as possible before shipping them. Strings usually break when you bring them back up to tension anyways, so if possible just take the strings off entirely and just plan on putting a new set on. If you have an archtop style bridge you may want to lightly scotch tape it to the top of the guitar so it doesn’t move. If I’m shipping the guitars in a hard case – I’ll usually run a little piece of bubble wrap around the neck where the neck is resting in the case. Even though better quality cases have a lot of padding there, I’ve still gotten neck dings from the case in tough trips. It might be paranoia now – but it’s worth the extra second to me. The post office was invaluable to be in getting a lot of other things here. All of the pedals and assorted small hardware shipped Priority mail. In addition to the free box – the rule is: if it fits in the priority box – it ships – regardless of weight. And I took full advantage of that. A long time ago at a day job I had – I was berated by a boss for not using a full roll of tape on a computer box he was shipping. “Tape is cheap – fixing something that fell out of a broken box is expensive.” With the priority boxes I write the addresses in marker on the box – and then encase the boxes in clear plastic packing tape. It addition to giving the box more support structurally (believe me I had some heavy things worked into those small boxes), it also prevents the address label from getting ripped off (lesson learned the hard way leaving Boston) and it makes the package less susceptible to rain damage. Pedals were bubble wrapped as were expensive audio converters, headphones and other fragile items. Music books, DVDs and CDs (remember them?) – were all shipped media rate in boxes I grabbed from the local pharmacy. The grocery store is a good place to look for odd sized boxes – but be sure to only use boxes with canned or dry goods. You probably don’t want all you’re clothes to stink of rotting ice cream. The heaviest boxes I shipped cost $20 or less to ship from one coast to another. That’s an amazing deal to me. I don’t get insurance but I get delivery confirmation on EVERYTHING I ship. The critical thing to know about this is that USPS isn’t well-organized with backtracking things. So – when I shipped some priority boxes to Mrs. Collins (with – unbeknownst to me – about $1000 worth of flamenco shoes and accessories) and then misplaced the receipt – they had no way of looking up the package. without them – you’re screwed. Organization is a key component to a move like this anyways. If I was really organized this time I would have had a book, and a numbering system for each box where I could tell you exactly where anything. The move was chaotic enough that it didn’t happen. The plus side is that by keeping all the receipts (and the confirmation tags) – I could go through and make sure that everything got here (which it finally did). This was of moving definitely isn’t for everyone. You have to surrender some control and get used to the idea that things show up in a time frame when they do. But it’s worked for me so far. It also had the additional benefit of exposing me to everything I was moving and allowed me to find some things I was looking for and get rid of a lot of things I didn’t need anymore. “Do I really want to spend money to have this in NY?” got rid of a lot of things I wasn’t using anymore. If I think of more about this I’l update the post. In the meantime, if anyone else has thoughts or ideas about shiping instruments or moving by mail – please post them! I hope this helps and as always thanks for reading!